Mermaid Quay, the waterfront leisure & retail quarter in the heart of Cardiff Bay, is hosting a nine-day family-friendly art festival over the half term holiday week. Every day from Saturday 24 October to Sunday 1 November will be packed with fun arty activities for all to enjoy – from a giant colouring-in cube on the Quayside and the crazy antics of the Art Critics street theatre via childrens’ workshops in the week to a fabulous Art Fair at the end, there’s something for everyone. • Giant colouring in on the Quayside: A giant cube of original hand drawn black & white cartoons by artist Scott Walker located on the Quayside. To be coloured in by visitors of all ages, while Scott himself talks to budding artists and encourages creative play. • The Art Critics: Two flamboyant ‘lovies’ who find the beauty in everything. To them everything is a piece of art. Dressed in their colourful outfits and suitable moustaches, they critique everything they see from plants to wheelie bins! • Art Themed Treasure Hunt (in association with the Wales Millennium Centre): Find the arty clues and submit your completed treasure map form for a chance to win a meal for 4 at Punk Panda plus tickets to a show at Wales Millennium Centre. • Colouring in competition at Zia: Visit Zia on Bute Street and colour in the spooky picture for your chance to win 10% off in store plus a cauldron of spooky treats! • Colouring in competition at Top Gun: Win a children’s birthday party at Top Gun for 10 people by entering the colouring competition in store. • Spooktacular Art Attack competition: Post a spooky piece of art on the Mermaid Quay Facebook page, tweet it to us @mermaidquay with #MQArtAttack or hand it in to the Art Fest staff for your chance to win a meal for four at Gourmet Burger Kitchen, Mermaid Quay. • The Art Attack competition, colouring in Cube on the Quayside, Treasure Hunt and competitions at Zia and Top Gun continue plus look out for your favourite cartoon characters with giveaways. • ‘Picasso’ Griffiths, Caricaturist: Fun and entertainment from one of Britain’s top caricaturists as he captures the essentials of a character to create a unique memento to take home and cherish for ever. • The Art Attack competition, Treasure Hunt and competitions at Zia and Top Gun continue plus look out for your favourite cartoon characters with giveaways. • The Treasure Hunt and competitions at Zia and Top Gun continue plus look out for your favourite cartoon characters with giveaways. Join us for a day of spooky storytelling on the Quayside, plus enter our Art Attack Halloween competition to win a meal for 4 at GBK, Mermaid Quay. Post your spooky piece of art of the Mermaid Quay Facebook page, tweet it to us @mermaidquay with #MQArtAttack or hand it in to Art Fest staff for your chance to win. Visit the Art Fest marquee where our witches and wizards will be on hand to help create the spooky art. • Art Fair on the Quayside: The Art Fest finishes up with a fabulous Art Fair on the Quayside. We welcome artists from around Wales to display and sell their handcrafted pieces, so come along and see the Welsh talent. 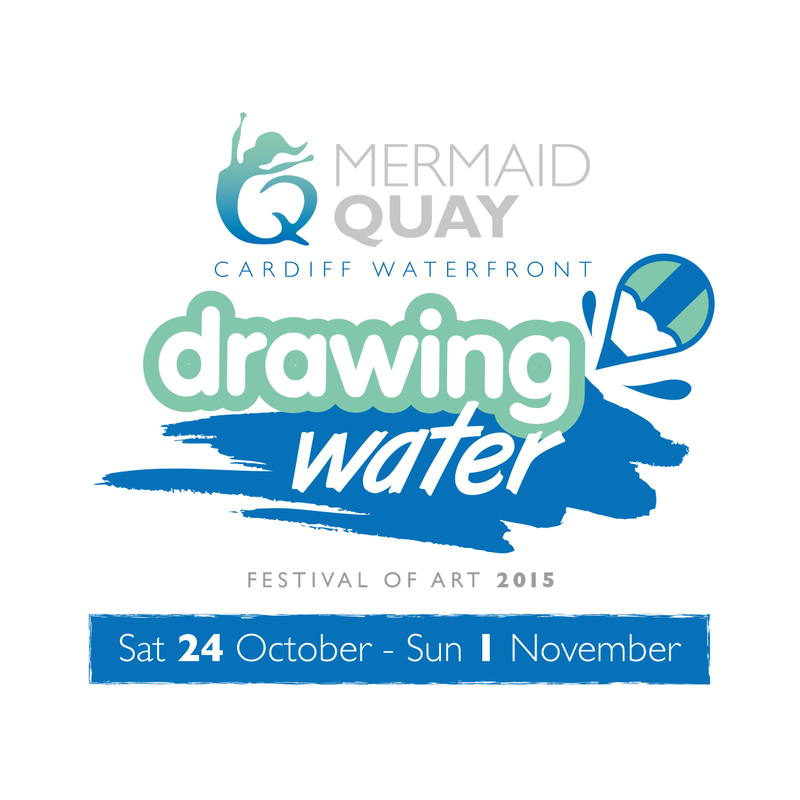 With waterfront restaurants, cafés and boutique shopping you’ll be drawn to the Mermaid Quay Drawing Water Art Fest 2015 – a great day out for all the family.